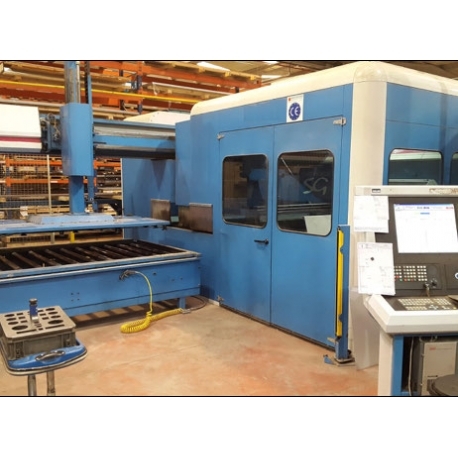 Includes tower and automatic discharge system SG + STS Working hours: 58269 Specifications: Hammer force: 300 kN Number of turret stations: 20 pcs Number of stations with 2 Multi-tool: 30 to 66 pcs Maximum punching diameter: 89 mm. Maximum material thickness (punching): 8mm. 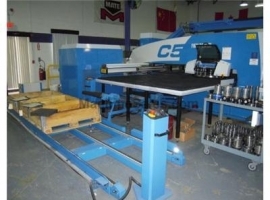 Index CNC Tool: - Maximum number of stations indexed: 10 pcs. - Maximum punch diameter: 89 mm. - Maximum tool rotation: 58 rpm Built-in straight angle shear - Maximum material thickness (cut): Aluminum: 5mm. Fe 52 / Fe 37 steel: 4mm. Stainless steel: 3 mm. -Minimum material thickness: 0.5 mm. Full bump cut, X x Y maximum: 800 mm. 1528 mm. 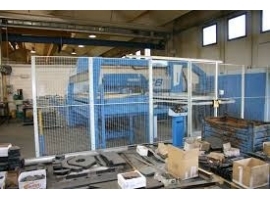 -Adjustment of blade tolerances: manually by screws Max weight: 200 kg. Plates with automatic positioning: pneumatic, 3 pcs. Maximum sheet size (X x Y) 3061 mm. X 1528 mm. Route X: 2584 (X-42 to X2542) Route Y: 1560 (Y-25 to Y1535) Maximum axis speed (X axis): 90 m / min. Maximum axle speed (Y axis): 60 m / min. Maximum travel speed: 108 m / min. Maximum hit speed: 1 mm. Between holes 1000 1 / min. 25 mm. Between holes 430 1 / min. 150 mm. Between holes 150 1 / min. Precision punching according to LKP-7100 -Maximum deviation of hole location (X / Y axes): 0.1 mm. -Maximum distance deviation between holes (X / Y axes): +/- 0,05 mm. -Maximum angular deviation (index CNC): +/- 0.1º Positioning accuracy in accordance with VDI / DGQ 3441 - Positional deviation Pa (X / Y axes): 0,08 mm. (+/- 0.04 mm.) -Disposal position Ps (X / Y axes): 0,04 mm. (+/- 0.02 mm.) Rotation of turret: 23.8 r / min. Tool change time: 1 to 3 sec. 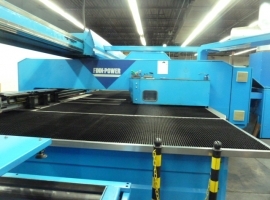 CNC Control: SIEMENS Volume of the oil tank: 330 l. Power supply: 50 kVA Average power consumption: 30 kW Maximum compressed air consumption: 5 Nl / s Minimum compressed air pressure: 6 bar Maximum cooling capacity of the oil cooler: 30 kW Airflow in refrigerator: 3.9 m3 / s Weight of the machine: 22,000 kg. Weight of electrical cabinet: 800 kg. Weight of the hydraulic unit: 750 kg. Weight = 22000 kg.